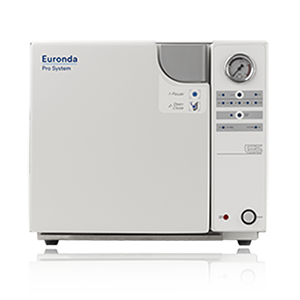 E5 is an autoclave from the Euronda Pro System sterilization line that offers an outstanding quality-price ratio while still maintaining Euronda’s exceptional safety standards. It is a completely automatic Class N electronic autoclave that is controlled by a microprocessor. It features a thermodynamic working method with pressure and temperature control systems. There are two sterilization cycles (121°C and 134°C), allowing users to select the one that best suits the needs of their dental practice. Their progress can be tracked thanks to the light and sound signals from the control panel. Drying time: 15 minutes. Door opening/closing mechanism with dual safety microswitch. Anti-reflow separated tanks, analogical pressure gauge, synoptic cycle advancement. 450 x 385 x 500 mm.